Without a doubt, in my opinion, one of the best safety tools in my shop are my GRR-RIPPERS! They’re extremely diverse in the way I can configure them for the tool I’m using, and give me a peace-of-mind like no other pushblock I’ve used in all my years in the shop. Some woodworkers are thrown off by their price, but what’s the price for the peace-of-mind that comes with knowing you have a safety tool system, that when combined with common sense makes you all that much more safe? 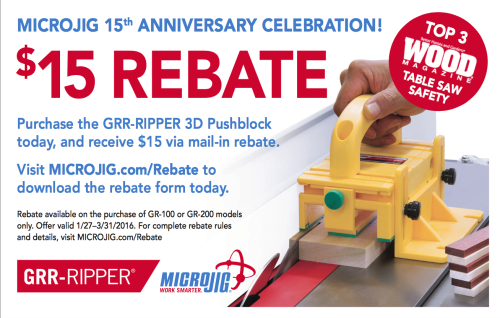 To help celebrate their 15th Anniversary, and at the same time make woodworkers all over the country safer than ever, MICROJIG is offering a $15 Mail-In Rebate on the purchase of a model GR-100 or GR-200 GRR-RIPPER 3D Pushblock*. Take advantage of this great offer before it slips away. Ordinary pushblocks are easy to make in your own shop, but they don’t offer the same features, options and more importantly, peace-of-mind you can get with the GRR-RIPPER! *This offer is valid only on the purchase of GR-100 or GR-200 models purchased between 1/27-3/31/2016. For complete rebate rules and details, and to download the mail-in rebate form visit MICROJIG.com/Rebate.